It’s hot, it’s summer, it’s ice cream season! Cue low-calorie ice cream pints. Ice Cream is my Favorite, well, everything! I grew up LOVING the dessert – a nice lil characteristic I picked up from my dad’s side of the family. To this very day, I blame over-consumption of this amazing frozen treat for my rapid weight gains. In fact, there were some periods of my life where I would knock down a pint a day (i’m looking at you college & your meal planned ice cream bar). At my heaviest, which was also the peak of my ice cream craze, I could easily eat a half gallon in a sitting. Crazy, I know. Safe to say I’ve curved my ice cream indulgence drastically since starting Weight Watchers. That being said, that doesn’t mean I don’t still have my dessert nights. Let’s be honest, sometimes every night is dessert night now that protein, low-calorie ice cream is a thing! If you’ve been following any Weight Watchers member’s accounts on social media, then you’ve probably crossed paths with this ridiculously popular Enlightened flavor. By far, it is definitely the most unique low-calorie ice cream pint I’ve tried, but hear me out because it’s dang near amazing! Movie Night ice cream consists of “popcorn” flavored ice cream, caramel swirls, and loads of mini chocolate chips. You read that right, popcorn. If you’re someone like me who needs a little texture in their frozen treats, then go ahead and grab your largest spoon because this Enlightened does not gip on the chocolate chips. It is also important to note that the popcorn doesn’t taste like popcorn per say, more like a butter pecan without the pecans. I 100% recommend everyone trying this flavor at least once! Shout out to my cousin Michelle for sending me this next flavor. Oh, Aldi…sweet, sweet Aldi! They too have recently begun carrying a low-calorie ice cream line, and I am here for it. 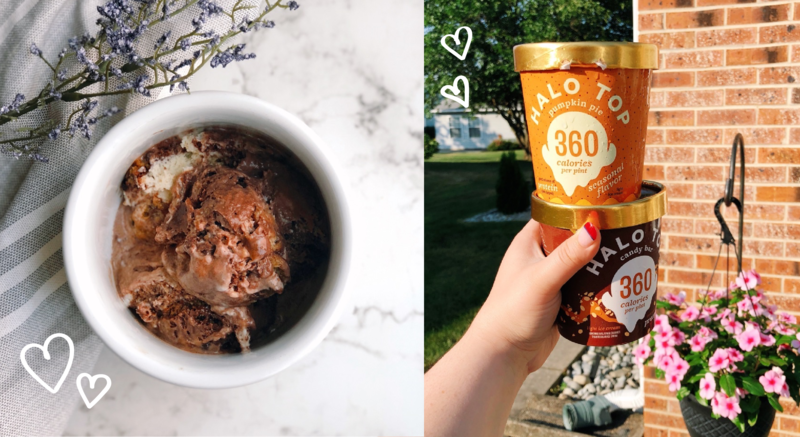 Though their flavors are basic (my Aldi carries vanilla, chocolate, and mint chip) and are comparable to other, larger name brands like Halo Top and Enlightened, their price is what really makes them shine. For $2.99 a pint, you can’t go wrong! My favorite is their super smooth chocolate flavor, but all three are notable & deserve some love. Cookies & Cream has been my OG ice cream flavor throughout the years (if you look through my old blog posts, one of them contains a photo of me eating a half gallon of Friendly’s Cookies & Cream…can’t make this stuff up lol! ); however, when it comes to the majority of protein or low-cal ice versions of this flavor, they just miss the mark. Because of this and my own bias of this flavor, I put off testing Breyer’s rendition, assuming it would be less-than-stellar like the others. Well, what the heck was I thinking? This Breyer’s Delights flavor could literally pass as it’s original! Normally, healthier Cookies & Cream options contain smaller “cookie” chunks, and are often overly sweetened and off in flavor. I’m pleased to say that this Breyer’s Cookies & Cream is CHUNKY, like, whole hunks of cookies, chunky. Not only that, but it doesn’t have that fake taste at all, probably because it’s one of the few brands that still uses cream rather than skim milk and gums. If you haven’t tried Breyer’s Delights, run out and buy a pint right now! I’d like to thank for the internet for the discovery of this pint! Before this little experiment, I researched other’s top protein ice cream flavors, and this one made almost every list. Total Halo Top celebrity status. Well, I can confirm the ravings are 100% justified. This ice cream tastes just like a candy bar and is jam-packed with nuts and chocolate swirls. Not only that, but it’s smooth and creamy unlike some other flavors out there (IMO). If I hadn’t read the label, I wouldn’t have even known it was a protein ice cream. By far one of the better Halo Top pints. This one is for all your fruity ice cream lovers out there. I’m more of a chocolate or cookie gal myself, but every now and then it’s nice to throw a strawberry or cherry vanilla into the mix. My go-to before Weight Watchers was Ben & Jerry’s Strawberry Cheesecake ice cream, and this Enlightened flavor is a close runner up! The ice cream itself is cheesecake flavored, with swirls of strawberry throughout. Dollop a bit of fat-free cool whip on there and you may as well be eating a slice of cake at the Cheesecake Factory! Okay…maybe not that far, but it’s close. This just had to be on the list somewhere, and since it’s technically a seasonal flavor, it gets an honorary mention! I love pumpkin anything and this pint tastes just like a frozen pumpkin pie – tiny bits of crust and all. I’d be lying if I said I didn’t watch the Nightmare Before Christmas and shop for flannels after eating this. If you see it stocked in stores this Fall, give it a try! While, in my opinion, Halo Top & Enlightened have the best protein ice cream flavors on the market, that doesn’t mean I didn’t try a few others. Below are some additional brands that make low-calorie pints, and some reasons why they did not make the cut. It’s important to note that these flavors aren’t necessarily bad (I know many others who enjoy these brands) they just weren’t doing it for me. Arctic Zero & Skinny Cow: Too icy & gummy, tasted very artificial. Ben & Jerry’s: Higher in points and (my pint at least) was very icy & overly sweetened. And that concludes Lose it Lyss’ Top 5 Low-Calorie Ice Cream pints! As you can imagine, I thoroughly enjoy trying out new flavors, so if you have a favorite that isn’t on this list or your just think I should try, shoot me a comment! Like I mentioned earlier, this list is not at all set in stone, and I look forward to expanding it once I get even more flavors under my belt…literally. As always, thanks for stopping by and have a happy and healthy day!